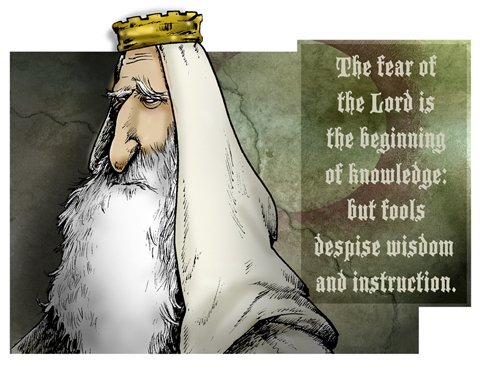 Considering he had 700 wives and 300 concubines, I'd say "fear of the Lord" was waaaay down Solomon's to-do list. John - it appears you perfectly captured the expression of a man surrounded by far too many females for his own good. 700 wives and 300 concubines? 1000 divided by 365.....GOOD GRIEF! No wonder the poor guys tired! His alchemists weren't looking to change lead into gold. They were looking for Viagra! I'm thinking he never left the seat up. Knowledge & wisdom are worthless if not heeded (or hermeneutically twisted to suit one's desires)... & so Solomon fell (except in Islam--which might explain the Muslim view of women as chattel--as well as the decline to [or tacit acceptance of] Islamofascism). This page contains a single entry from the blog posted on October 4, 2011 6:48 PM.